with me and so do five adorable cats. I guess you could say we run a cat house! 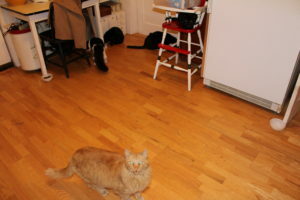 When Jamey first moved in with me, I had seven cats-Mackie, Skinny, Shorty, Buddy, Pippie, Smokey and Mr. Tux. Sadly, we lost four of them in an eight month time frame. Shorty, Smokey, Pippie and Mackie are all waiting for us at Rainbow Bridge so we can reunite someday. With three out of the four girls gone, that left only Skinny. She’s part Siamese, and Siamese cats are intelligent and really need company. So, we adopted a beautiful tuxedo kitten from friends and named her Lady Jacqueline Josephine. However, Jackie Jo proved to be just too much for poor Skinny, who has 13 years on little Jackie Jo! So, to take the focus off Skinny, we adopted a black kitten from the pound and named her Rita Jean. It worked-Jackie and Rita fight and tumble like kittens are supposed to, while keeping good company for Skinny-and two little sisters to boss around! The boys, Buddy and Mr. Tux, prefer to stay outside. As a result, we have very little on the line of mice in the neighborhood. However, this winter, they will need to come inside and we’re working on finding a solution so they don’t do their “boy cat” thing in the house! Each one of our cats has his or her own purr-sonality and we love each of them very much. We recently had a health scare with Skinny (after all, she’s 14), but except for being “stopped up”, she came back in good health. She doesn’t much like taking her medicine, though! Living with cats has certainly made our lives better and our houses real homes!